The rooftop Barbecue Nation and poolside Turque Lounge are highlights at Sayaji Pune, along with a spa and the multi cuisine Portico. Location: Sayaji Hotel is a five-star luxury hotel located on the Mumbai-Bangalore Bypass on Highway Wakad. The closest modes of connectivity are Chinchwad Railway Station (7 Km) and Pune Lohegaon Airport (22 Km). Major attractions which guests can visit include Central Mall (12 Km) and Omkareshwar Mandir (15 Km). Room Amenities: The Sayaji hotel offers over 244 rooms categorized into The Grande and Sayaji Grande Suites. The rooms come equipped with a mini-bar, flat-screen TV, safe deposit locker, tea/coffee maker, iron and iron board, dental kit, laundry bag and en suite bathroom with premium toiletries. Hotel Facilities: There are several recreational facilities such as a rooftop swimming pool, gymnasium, spa and steam room. 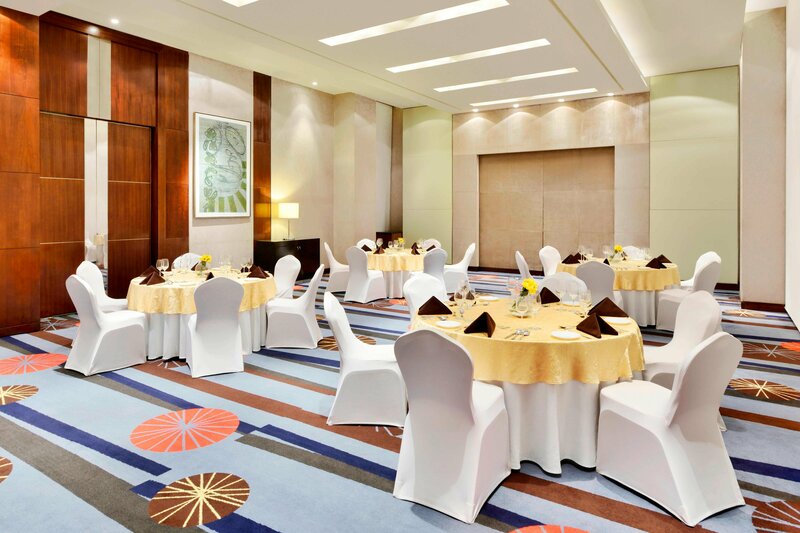 For events and meetings, the Sayaji Hotel offers specially designated indoor and outdoor spaces. These are named Sapphire, Sapphire Lawn, Emerald 1 and Emerald 2. Dining: Portico is Sayaji Pune's flagship restaurant offering a mix of different cuisines such as Indian, South-East Asian and European, along with fine cocktails and lavish buffet for lunch and dinner. Barbecue Nation is the rooftop restaurant offering elaborate vegetarian and non-vegetarian dishes. There is also Turque- the poolside lounge for exquisite dining. Deal Applied: TRIPD2. You Get Flat INR 1128.0 OFF! Deal Applied: TRIPD2. You Get Flat INR 1424.0 OFF! Deal Applied: TRIPD2. You Get Flat INR 1803.0 OFF! Pathetic. Very bad bad bad. No ways they will not correct it. It's only a improved average Hotel. Apt location for quick in and out. Hotel provides good facilities. Location is convenient on highway and away from City crowd. The reception on every floor is a bad idea if they cannot check all the details, like id card and all. Also they asked for it late night and we got into argument at 11:30 PM India time. Horrible people. Perfect stay with the hospitality provided by Sayaji staff. My sons Birthday was there and we got a very good 1 pound complimentary cake inside the room which was the moment. The food at portico, the gym and swimming pool all were excellent to be used and small children play area was very well done for the kids. In all very good stay and would definitely visit again if we end up staying in Pune area. Service was very good. Staff was very friendly and professional. Special thanks to Soumen who took good care of my stay. Range of food was vast and the quality was good. Room size is very small, cost charged not worth due to room size. Break fast can add fish also Swimming pool too small. Hotel is superb. Spacious room with all amenities. Location excellent. Bang on the highway, easily accessible from Mumbai. Staff excellent. They are extremely helpful and courteous. Food excellent, Food is very good, moreover, the spread of breakfast is also very apt. Facilities excellent The room is spacious and neatly maintained. I liked especially the Ipad control of the in room facilities. Overall verdict excellent I really liked the Hotel, I will definitely come back every time I will visit Pune. Room could have been better decorate. I can rate this hotel as OK. Poor reception, no welcome, no smile on staff faces, Hotel does promise welcome drink on arrival how ever there wasn't such thing at all. In room amenities we're not as per the standards. Good thing noticed was behavior of F&B and room service staff. Food was good. In short this property belong to average hotel. Am short of words to appreciate this Hotel Sayaji and their staff. I Am extremely satisfied with their warmth and caring nature. We reached their at 11 Am and the valet helped me to Park my car as I insisted to Park my Mercedes by myself. He also made sure to freeze a parking spot till we are staying in this Hotel Sayaji. The check-in process was amazing no need to wait just gave my name and got my keys right away. Later in the staff my Dilip came for the formalities. Mr Dilip also explained us about the Hotel Sayaji and he was very helpful. I told him in morning I Am travelling to a temple so he kept my breakfast ready so that I can carry in car. Best part of this Hotel Sayaji is the restaurant and the food. Amazing food and they serve with love and force to taste. Very rare quality. Mr. Deepak was the person who used to take care of us and served us food. We were there for three days two nights but this Hotel Sayaji will be in my memories forever. I have to come back again. I Am short of words to appreciate this Hotel Sayaji and their staff. I Am extremely satisfied with their warmth and caring nature. We reached their at 11 Am and the valet helped me to Park my car as I insisted to Park my Mercedes by myself. He also made sure to freeze a parking spot till we are staying in this Hotel Sayaji. The check-in process was amazing no need to wait just gave my name and got my keys right away. Later in the staff my Dilip came for the formalities. Mr Dilip also explained us about the Hotel Sayaji and he was very helpful. I told him in morning I Am travelling to a temple so he kept my breakfast ready so that I can carry in car. Best part of this Hotel Sayaji is the restaurant and the food. Amazing food and they serve with love and force to taste. Very rare quality. Mr. Deepak was the person who used to take care of us and served us food. We were there for three days two nights but this Hotel Sayaji will be in my memories forever. I have to come back again. We stayed for 3 days on a personal trip. Good ambience exceptional hospitality. Personalized care by Hotel Sayaji staff. Very good movie collection in surrounds sounds home theater. Exceptionally good gym. The cleaners are also well trained and cleanliness is very good. Room service menu good and reasonably priced. Both restaurants are good. Breakfast choices also good. We have recently started staying couple of 5 star properties in past two months. We found this one very good. One suggestion can install a floor controlled substance in elevators. Overall very good. Amazing intelligent building management system. Room size little small. I would say that I stayed at such a nice property located at Pune- Bombay highway. Room was very nice, food was delicious, staff was very supportive and honest too as I forgot my earphones and I called up floor incharge Mr Sagar and he got the room checked immediately and not only found it but also sent that at my address so this was greatly appreciated. So, both location and property is excellent and nearby sightseeing close to this Hotel Sayaji are Prati Shirdi Sai Temple and Lonavala.. I must have booked 100+ Hotel Sayajis in last 3 years but this one was one of the best experience. They have best of the check-in facility with a very unique concept. A reception on each floor. That makes your life very easy and you get very quick support for any of your queries. Rooms were clean. Food was good. Staff was very helpful and courteous. Breakfast had a large spread. Location is on highway which makes travel easy. Over all excellent for everything. Our experience of stay at Sayaji Hotel Sayaji was very good. Only one thing I did not like was the incidence that I received missed call from Sayaji Hotel, while we were having dinner at Poolside restaurant. When I called back on the number, I was asked when we will be vacating our room on next day. This is something I did not like at all. May the management we will consider this. Otherwise the experience of staying at Sayaji Hotel was very good. Sayaji is very good hospitality place. Its location is very convenient. Very well groomed staff. Courteous and very helpful. Food is very good. I think if you book directly they give rooms on a higher floor. If you book through travel booking sites you may get rooms on lower floors. Barbecue Nation one must experience. Rooms need to be more lighted as you don't need city view or mountain view. Good value for money. Had a 1 day stay but the Hotel Sayaji staff, food, cleanliness is very great. Rating should be 5 stars as I found no reason to question them quality. Hotel has all features and needless to go out of campus. Barbecue nation just add more flavour at the roof top. Liked - the Ipad concept in the room makes it really very great part food is extremely good inside the Hotel Sayaji, no need to go out anywhere. Sayaji Hotel is a different league of Hotel Sayaji in Pune. Rooms with latest gadgets, staff willing to help voluntarily and refusing any tips, parked car is washed at no cost. The list is very long and fulfilling. Only one major issue with this Hotel Sayaji is that they pamper their guests so much that one start expecting (rather unsuccessfully) same level of service in all other Hotel Sayajis. Food was great. Very much pleasant stay At that Hotel Sayaji. Location was very much convenient. Stay was very much comfortable. Highly recommend for business travel. Food was great. Very much pleasant stay At that Hotel Sayaji. Location was very much convenient. Stay is very much comfortable. Highly recommend for business travel. Wonderful stay at the Hotel Sayaji. Recommend. Good. Staff expects TIPS all the time. Be carfeul. Overall experience was very good. Was happy with the stay. Facilities and good was great. Staff was very courteous. Spa and therapy was excellent. Could relax totally. Would like to visit again. Extremely comfortable Hotel Sayaji rooms are clean and spacious staff is very supportive. We checked in late night and were offered welcome drink. Always prefer to stay in sayaji wherever it is available. Location was it's very good. Food is also good. Good facility, but scope to improve in all the things. It was good stay here . Nice room . Cooperative staff. Overall best experience. Service, staff, Food and attitude to serve better, perfect picture of hospitality, no waiting for check in & check out. The speakers were awesome, all controls were on a Tab. Travelled with family to take small break. It was first time I opted for this Hotel Sayaji and it was more than expected. Overall a good place to stay. However there are restriction with guests in room. Choose the place only if you need a good peaceful stay away from hustle & bustle of Pune. Barbecue Nation only through advance booking. No walk in. Well mannered staff willing to go extra mile to serve guests. Good reception and response. Very polite and respectful staff. Nice stay. Good food and decent Service as always. They have a great staff. Want to mention of their Chef Mr. Mouths who personally visited my room to understand my food preferences and delivered exactly. Keep it up. A good stay to sum it up. Keep it up the good work and keep exceeding expectations. Awesome room, good food, friendly staff ... Had a great time at Hotel Sayaji ... Even the floor reception was very helpful. Would love to visit regularly ... Poolside restaurant was a great experience. Not the first time for me. This place is situated right on the highway making it a very convenient location for me. It's a very clean place and the staff is really friendly. As a business traveller it perfect. Good food too. The breakfast was just right. Will visit again. It was nice to stay, I am very pleased with your great service and kind staff, on single call your staff members are ready to serve. Food was awesome and delicious .. Great kitchen staff. Poolside dinner was too beautiful and had great food there. The staff is extremely courteous and helpful. The O2 spa massage is excellent. Pedicure was OK. The food is fabulous especially the breakfast and the tandoori dishes are yummy. Hotel give me a complimentry pick-up facility from airport. Room was very comfortable. Nice and clean rooms. I like very much. Great place to stay. On the highway. Great place to relax with family. Close proximity to highway. Rooms are good and the buffet and breakfast spread is fine. The overall experience is good and makes you feel relaxed after a long drive. Overall a great experience. Very good and well mannered reception persons. Food is also very nice. Overall a nice experience.